Welcome to the more streamlined Express. We wanted to give you a little preview of the latest update. Over the past months we’ve been talking to users to get their input on what they wanted to see in our newest Express update — and the feedback was pretty much unanimous. Our users asked us for a time-tracking tool that was faster, easier to use and more streamlined. “An app that lets me get in, enter time and get out in under ﬁve minutes,” was representative of the suggestions we received. So as we incorporated user feedback into this iteration of Express, that’s where we put our focus. The result is an optimized Express that’s fast as lightning (and easier on the eyes). We redesigned the menus to make navigation faster and more intuitive. We implemented a wholesale redesign of the interface and made major improvements to the menus so users have everything they need right at their ﬁngertips. By removing the sidebar and putting the main navigation across the top of the page, we’ve radically changed the way users interact with the system. This simple alteration provides easier access to major functionality and frees up more useful space, so that your data (e.g. timesheets, reports, etc.) get some much-needed breathing room. 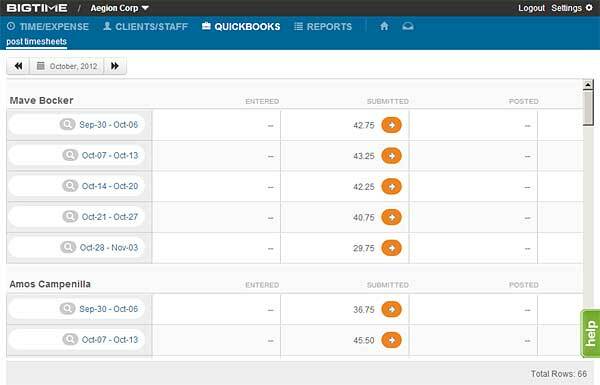 Making QuickBooks quicker, and posting timesheets a whole lot easier. Being able to quickly pull timesheet data in and out of QuickBooks is one of our users most important features, so we made it a priority to make it faster and much easier to do. Note that on the left panel of the dashboard there’s been added a “refresh” icon. Now with one click, all of your QuickBooks ﬁles are instantly updated and pulled down to BigTime. There’s also a new set of “quick setup” screens that make it a breeze to get timesheet data ready to post when you push it through the “Post Timesheets” pages. And we’ve removed the requirement that each time-entry must be linked to a service item. The default assumption is now that you’d like your time to be non-billable if there isn’t a service item attached. Want to track time without opening your browser? No sweat. This new version of Express comes with our very ﬁrst desktop widget for BigTime. The widget, for use on a Windows7 desktop, gives users all the core functionality they need to track time — no browser required. Plus, we’ve made it super-easy for Express users to start and stop timers, add/edit notes and review daily/weekly timesheets. 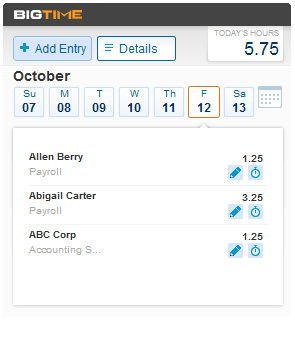 Now users can more easily log time and capture hours that might otherwise get missed. Loads of new features, and more to come! As our Express user base continues to grow, we will be eliciting feedback and incorporating user suggestions into future versions of the product. Our goal is to keep adding new features, making the product more intuitive and easier to use — and it’s suggestions from users like you that help us make it better. So if there’s some feature you think might be helpful, or if you just have questions, please email us (at [email protected]) or give us a shout from the chat window on the site.